This summer, when I was thinking about the upcoming homeschool year, I was googling . . . I don’t even remember what. A particular book or workbook, who knows? But I bumped into the website of a homeschooling mother who has so generously shared very nice schedules for several subjects. These are rich in options and resources, and the more I clicked around, the happier I got. We ended up using her Biology scheduling/resources, American History 2 for the younger two here, and one of her Bible curricula. At this point, the children are very much enjoying these. I have in particular been underwhelmed by the Biology texts I’ve used – this uses an online text but incorporates many other resources from videos to online labs to in-life labs. She has a tip jar which I intend to use, but doesn’t ask for anything. She says she’s been blessed in life and wants to bless back :-). I’ve got a new hero! Well, naturally Chardonnay did eventually have her kid. She had one quite large buck who amusingly enough looked super similar to Selkie’s white goat. We called him “Jupiter” and he was the most cuddly sweet boy ever. 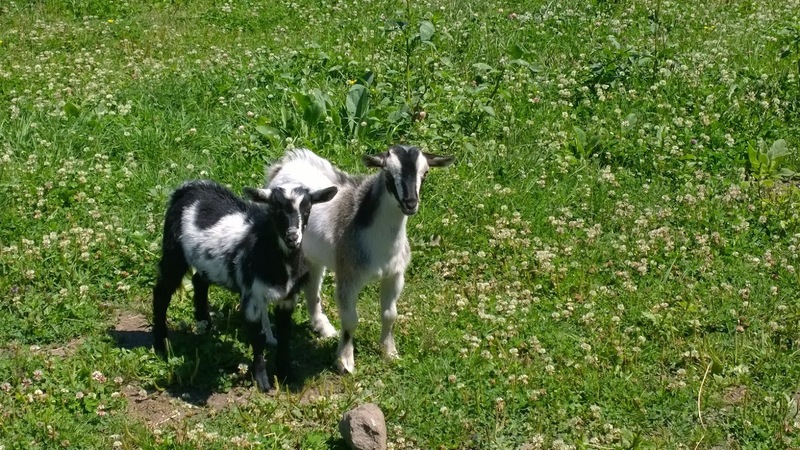 I am using the past tense here because last week both of our boys (wethered) were sold to a lovely home with a nice big pasture and other goat friends. So glad they went together and we are all happy about where they landed. Chardonnay took the departure of her kid surprisingly well, given our limited experience of these matters. She seemed a little down for a few days, lying around more than usual, but Selkie has mellowed out (or is just exhausted by still having three daughters here) and is allowing Piper, the daughter who looks like Jupiter, to hang out quite a bit with Chardonnay. Piper will nap cuddled up to Chardonnay, bite her ears, and jump on her back. I guess the acid test will come when we sell the girls. They’re all tattooed and ready to go, just waiting on the American Dairy Goat Association to complete the paperwork to get them registered, then onto Craigslist they go. A couple of days after the boys left, we heard a whole lot of duck quacking in the backyard. For a couple of minutes we didn’t think much about this, as they get in a ruckus now and then. But it got louder and more urgent, we sent one boy then another out back, and a black cat was chased off. Jemima Dorothy was alive, but just sitting there. The only thing wrong that I could see was something “off” with one of her wings, but night was approaching, so I had Nigel fluff up the straw in her favorite corner of the barn and Gareth went about the evening milking. When Nigel went out in another 15 minutes to put all of the animals away for the night, he found Jemima dead. It was so sad – she was a good layer and the leader of the flock, just turned three years old. 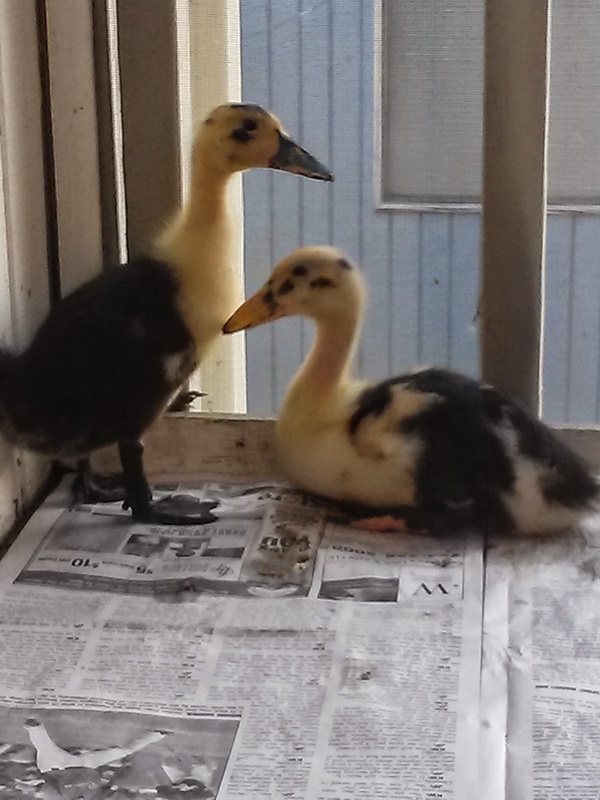 So this week we bought two more ducklings. They are a different breed – Anconas. They’re currently a month old, so we’re back to having very messy ducklings on our screened porch. We do take them to the yard for a time each day. Anconas can’t be sexed until they develop their feathers, so we’re crossing our fingers for two females. If we end up with a male, the delightful seller will exchange for a female. Like our Welsh Harlequin ducks, these won’t be yellow and black when they feather out, but white and black. We took them out to meet the big ducks yesterday. We were SO surprised by what happened. 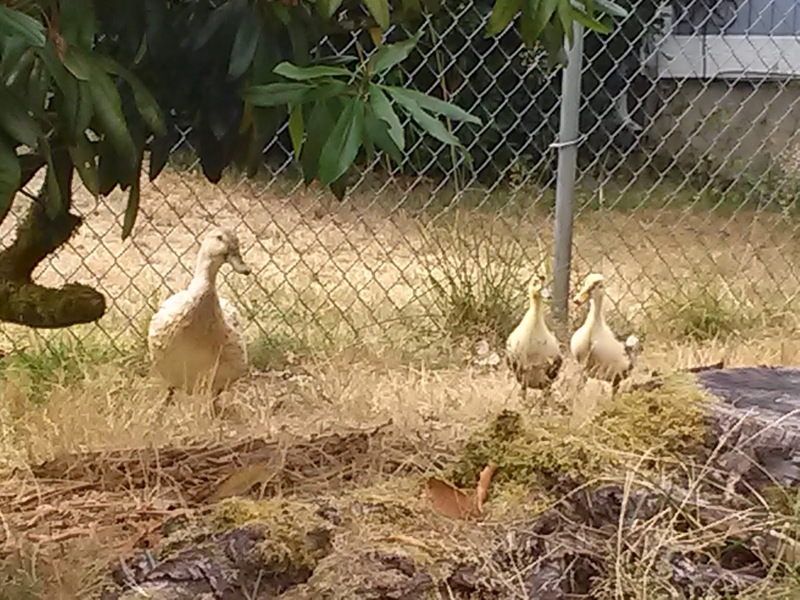 The little ducks were in the front yard, and Gareth herded the big ducks out to meet them. We were all ready to grab the big ducks if they attacked the little ones, but to our astonishment, the little ducks were thrilled and ran full-tilt toward the big ducks, peeping loudly, and the big ducks, terrified by these small loud things, ran away as fast as they could. Much cartoonlike chasing ensued. Currently there are what we think are 10 females, between ducks and goats! We’re anticipating the little goats leaving soon, as we can’t all go anywhere together currently; someone needs to be here for little-kid-mischief. We have developed a new set-up for the ducks when we leave that should leave them protected from the neighbor’s cat and spent a couple of days throwing small rocks at it when it returned to the scene of the crime. So we are perhaps over-confident, but we’ll keep working with the situation. So that’s news of the barnyard. Demi Sudapa, youngest and biggest! Selkie did beautifully. The boy was breech, so there was some drama there. The children are living out in the barnlet today :-). Only the boy is nursing well, though, so I’m back out to the barnlet to see if we can’t bottle some colostrum into them. My goodness, looking at the date of my last post is just sad! So much has been going on, and the nausea really continued unabated, and often worse than ever, so pretty much all of my time and energy goes to keeping everything running. I did manage to get one little home project done – I’ll do a separate blog post for that. I had another endoscopy just about a month ago. It worried me greatly because the ulcers had returned, and I thought, “If the ulcers have returned, that must be because the H. Pylori has returned, and if the H. Pylori has returned, has the lymphoma as well?” It was a lonnnnnnng two weeks waiting for results; finally I just went in and got a copy of my pathology results and was very, very relieved to see that no H. Pylori was found, and no active lymphoma found, either. Because of the ulcers, I launched into a modified GAPS intro diet. Something that I removed by doing that has caused the nausea to dial way, way down. I am worried that it might be the dairy :-(. Not so much anything other than cheese – I am a cheese adorer. All kinds of cheeses, from caves in France to fields in Eatonville, Little Boy Blue to Beecher’s Flagship. We’ll see. I removed a boatload of stuff at the same time. If you know GAPS, you’re barely eating anything at first. definitely more than one in there! Chardonnay, on the other hand, is unfazed by the whole pregnancy thing. Her last birth, before we had her, was a set of triplets, so I guess she’s done with the whole amazement-at-baby-gymnastics gig. I will admit personally to being a little less amazed at every movement by the time pregnancy, say, seven rolled around. If you’re wondering why Selkie has a nice summer trim and Chardonnay is winter shaggy, I started to trim them both, but dropped and broke the trimmer in between goats! Arghh. Selkie was much, much shaggier though, so thankfully I did her first. 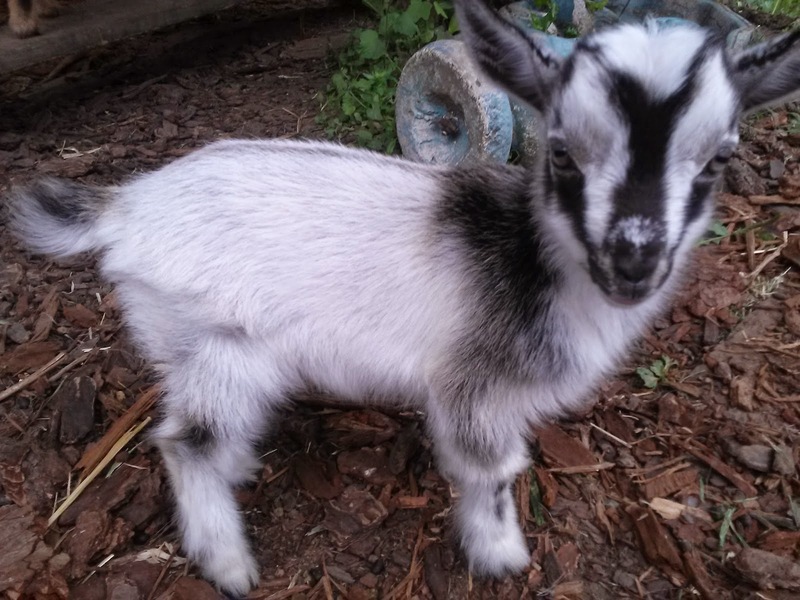 I will naturally be posting birth stories and adorable baby goat pics any day now :-). Nothing like spring to bring back blogging motivation! 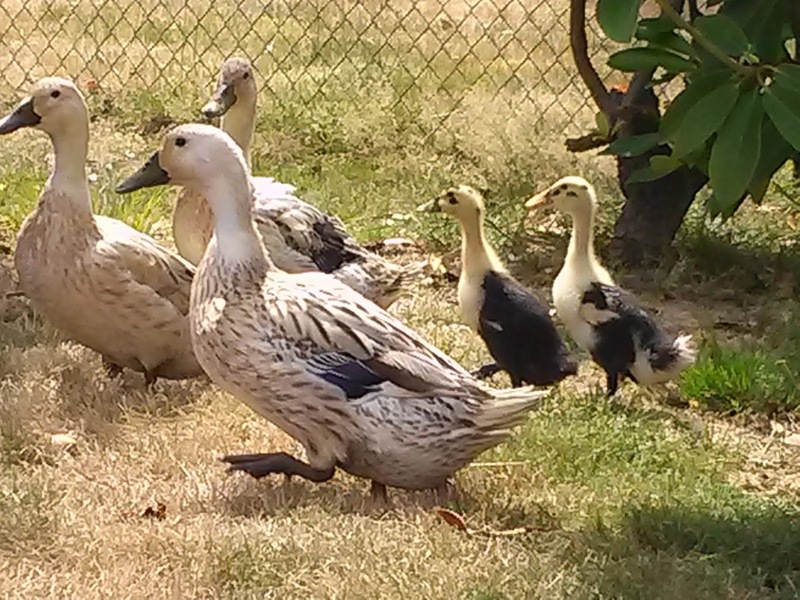 About a week before our cross-country trip, our ducks started moulting. Feathers were everywhere – the backyard looked like giants had been in a pillow fight. When ducks moult, they don’t lay eggs (my understanding, anyway), so I thought nothing of it that they weren’t laying. When we came back from the trip, though, they were al nicely feathered out, and still no laying. This seemed odd. The weather hadn’t turned yet – it was still August. Hmmm. I had the boys search our property (remember, we live on a regular suburban lot, not like they were searching the back 40 or anything), but no egg-stashes found. Fast forward. All autumn long, no laying. I began muttering about loud stinky pets. Then yesterday, Gareth had to climb into our hay storage to bring fresh hay forward. He found a pile of five eggs! We have no idea when they were laid, no idea how the duck(s) got into the hay storage, and I very strongly suspect that there are other caches we just haven’t found. One fresh egg this morning in the hay storage. What a mystery. Haven’t posted goat pics recently, have I? We had labs re-drawn last week, and as soon as we get negative results confirmed, we are hope-hope-hoping someone will be kindly disposed to breeding them. They are both super fluffy right now for the cold weather, which is good since some of those milking mornings have been in the twenties! While everyone else gets sick of politics, I am excited, excited I tell you, to throw my ring in the hat on this one. Proud participant in the “Crumpet, the most famous goat in the world” campaign. Every year, same thing . . . we say we’ll start sewing earlier for the winter reenacting season but forget to see exactly who has grown out of what early enough in the equation. This year was particularly brutal, as everyone had grown out of clothing but Sophia, and the Candlelight event isn’t one where we can just borrow last minute out of the clothing cupboard at the Fort. We didn’t end up needing to do one of our infamous five-females-sewing-all-night events, but Clara and Sophia and I did have a couple of nights into the wee hours of the morning. Lucida looks pouty, but that was just her “serious” face ;-). At any rate, those are new dresses on Clara, Araminta, Lucinda, and I, and Mama has a new bonnet. Beaded in the back and rabbit fur laboriously sewn onto the brim (I was sneezing for days doing that), but as I was the only one outdoors at this cold evening event, I got the hat. Well, actually, Clara was outdoors as well, but dancing, so she kept very warm. A lovely time was had by all, and almost a week later, some feeling is returning to our needle fingers! In my great-grandmothers' time it would've just been called "being a housewife": DIY home projects on a tight budget, the goats for milk and the ducks for eggs, as big a garden as can be squeezed onto the property, homeschooling, and eight children. This isn't a "suburban homestead" blog, not a remodel blog; I'm just a homemaker. Welcome to 1932, but with antibiotics. And the internet. And praise be, the washing machine. No recipes here . . . just a personal scrapbook as I focus for a year on sharpening my skills in the kitchen.